A heatproof battery for laptops, which could help solve recent problems with overheating, is to be mass produced by Japanese firm Matsushita. It follows a series of incidents where batteries overheated or caught fire. 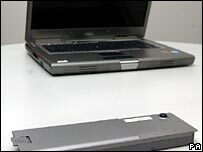 Sony has had to recall millions of laptop batteries in the last year and Matsushita and Sanyo also have had problems with overheating. Matsushita has added a heat resistant layer to its lithium ion batteries and plans to step up mass production. The company behind the Panasonic brand plans to produce five million units per month, up from 100,000 a month when the heat resistant batteries began shipping in April. Unsafe batteries have made headlines this year. Dell recalled 4.1m batteries, the cells of which were made by Sony, following reports of overheating problems. Matsushita Battery Industrial , a subsidiary of Matsushita, said that it has improved the safety of its lithium ion batteries by adding a heat resistance layer of insulating metal oxide on the surface of the electrodes. As laptops become ever more power hungry so the need for higher capacity batteries has increased. Matsushita hopes to step up production of heat-resistant batteries to half of all lithium-ion batteries it makes in 2009. Currently it produces 15 million lithium-ion batteries for laptops and 10 million for mobile phones. It holds a 13% share of the global lithium-ion battery market, trailing Sanyo, Sony and Samsung. All battery manufacturers are under pressure to develop safer batteries. The Institute of Electrical and Electronics Engineers is expected to produce new standards for batteries by the end of next year. The US-based Consumer Product Safety Commission has identified 339 cases between 2003 and 2005 in which batteries used in laptops and mobile phones have overheated.